Marie Veronique is like the quirky aunt we all wish we had. While chatting on the phone a few weeks ago, I can hear her smiling through the receiver the whole time. An image of her perennially in gardening gloves, perhaps a patchwork apron, rummaging amongst the herb garden comes to mind. She walks me through launching her organic skincare line, the skin microbiome and what has become her expertise: adult acne. In 2002, Marie, a chemist, teenage acne and rosacea sufferer, launched her eponymous skincare line with a single product: A completely zinc oxide sunscreen. This was during a time when literature was shedding light on the endocrine disrupting abilities of chemical sunscreens (the stuff everyone was using). With a corner on the market (they were the only organic, completely zinc oxide sunscreen at the time), the brand took off from there and with the help of her physicist and bio-medical engineer daughter, Jay, the line now encompasses over fifty products, two books (including my favorite – “Acne Answer: A Step-by-Step Guide to Clear Healthy Skin”) and placement in spas across the country. The line is organic, yes, but unlike others in their category, Marie Veronique’s line has transcended what can often pigeonhole brands and has become known as an expert on adult acne, rosacea and dermatitis. So, my first question to my new quirky aunt: Why are we seeing a rise in adult acne? What’s more important, what’s happening in the gut or topically as it relates to acne? “It’s both: diet and topical. Your gut health is going to be reflected in the health of your skin. If you have a healthy gut, you are more likely going to have healthy skin. They aren’t separate. Our approach topically is similar to how you should approach the gut. We believe in replacing some of the bacteria and balancing out the microbiome. For example, if you’ve taken a round of antibiotics, your microbiome is going to be out of balance. Usually, you will end up with some sort of intestinal problem. With the skin microbiome, if you use a topical antibiotic for instance, clindamycin, it will kill all of the bacteria on your skin disrupting the balance. It may work for a while, but once you stop the bacteria can come back with vengeance. And it can be very difficult to treat. What do you see most people doing wrong when it comes to treating acne? What skincare routine do you recommend? “We say cleanse once a day at night, but in the morning just splash with water. This will give you a nice environment of microbes. We have a five step regiment – cleanse, mist, serum, oil, and lastly sunscreen. For acne specifically, have the Treatment Line that incorporates oils, like safflower oil and sunflower oil which are rich in omega 6s. It turns out sebum, the kind of sebum that gets sticky and doesn’t go to the surface of the skin, is low in omega 6. So, you want to add that and it works wonders to clear up skin. “A lot of people try to separate the skin from the gut. They ask, ‘If I put this on my skin, is it going to clear it up?’ But the problem starts in the gut, so it’s really important to make clear to people you start with the gut and your skin is the support. Any last bit of skincare advice you want to share? “When it comes to aging, there is one ingredient out there that doesn’t just prevent it, but it also reverses the signs of aging and that is vitamin A derivative. Studies have been showing for the past forty or fifty years that it works. People use it for acne because it helps to regulate sebum production and people use it for aging because it helps to promote collagen. It normalizes skin cell development. Let’s say you have damaged cells, vitamin A derivative will replace those unhealthy cells which can show up as pigmentation. Skin will start to regain its youthful contours on a good retinol program. When you first start a retinol program you might breakout more or you might have peeling or redness. Many people think they’re allergic to it or they can’t use it, but actually, what they are experiencing is something called facial retinization. The retinol is going in deep to re-regulate the skin and develop normal healthy skin cells and it is pushing out the old unhealthy skin cells. For a while, it looks like there is all this activity going on and there is, but it’s not an allergic reaction. It’s actually your skin getting better. But this is the discouraging part for many people. The stuff works, but you just have to get the right one to work for your skin and power through the uncomfortable period in order to get the good results that you will get with a retinoid. It’s guaranteed. 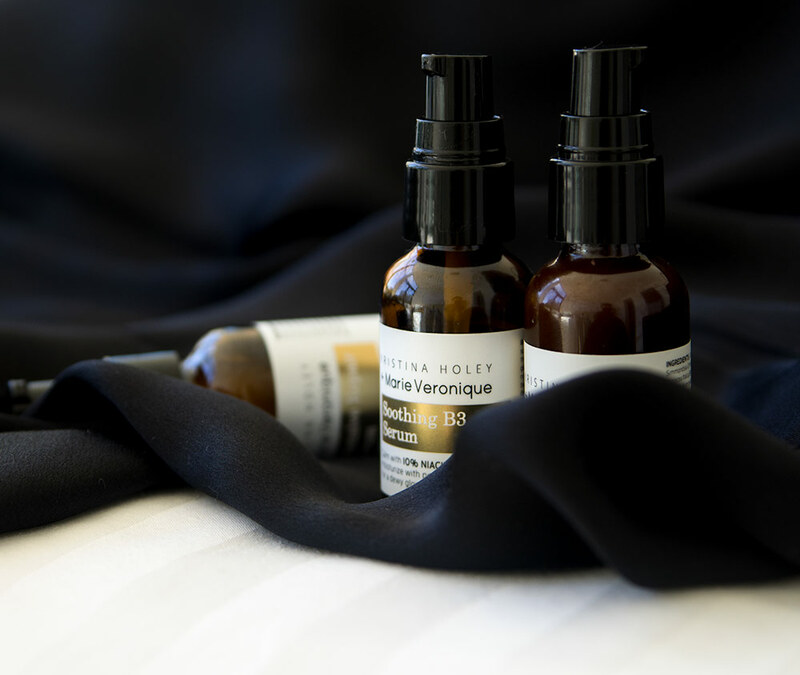 Read more about how Marie Veronique’s trio serums created with skin care specialist, Kristina Holey, radically improved my perioral dermatitis (don’t be scared when you see the before pics…).